Over the last five years, we’ve seen CPU performance on smartphones increase an average of 20+ percent every year without compromising battery life. However, the same cannot be said for laptops, which have struggled to adapt to a slowing Moore’s Law over the last few years, delivering annual performance gains averaging only single-digit percentages while failing to enable any significant increases in battery life. 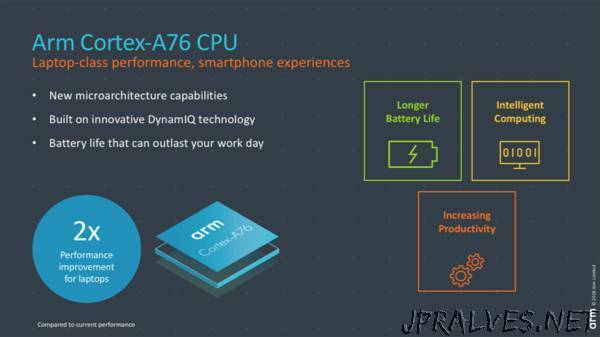 The new Arm Cortex-A76 CPU, based on DynamIQ technology, delivers laptop-class performance while maintaining the power efficiency of a smartphone. We’ve already seen the success of the recently launched Arm-based Windows10 PCs, delivering unimaginable 20-plus hours of battery life, a true LTE connected PC, and a trusted Windows app ecosystem. Building on that momentum, the new Cortex-A76 CPU brings choice and flexibility to consumers from a trusted architecture, delivering the 35 percent y-o-y performance gain along with 40 percent improved efficiency. As the only compute architecture delivering these generation-over-generation gains, it’s exciting to watch Arm continue to push performance while still becoming increasingly efficient.